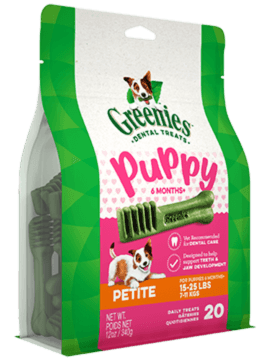 Start your puppy off with healthy habits by giving them GREENIES™ Puppy 6+ Months Dental Treats! Perfect for clean teeth, these treats are made with easy-to-digest ingredients and have a 50% softer texture* for a gentle clean down to the gumline. These chewy treats support brain development with DHA, and teeth and jaw development with calcium for your puppy. 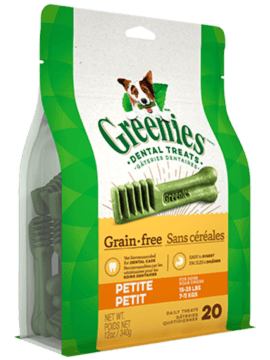 GREENIES™ Treats for Dogs are recommended by veterinarians for at-home oral care. These treats are proudly made in Kansas City with quality ingredients from around the world since 1996. 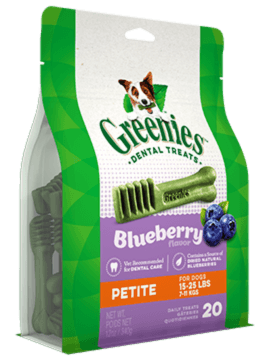 Celebrate your perfect puppy with these mouth-wowing, teeth-cleaning, grin-inducing GREENIES™ Dog Treats, and keep them and their teeth happy! Gelatin, glycerin, wheat flour, wheat gluten, fish oil (preserved with mixed tocopherols), minerals, (dicalcium phosphate, potassium chloride, salt, calcium carbonate, magnesium amino acid chelate, zinc amino acid chelate, iron amino acid chelate, copper amino acid chelate, manganese amino acid chelate, selenium, potassium iodide), dried chicken, water, powdered cellulose, lecithin, natural poultry flavor, DL methionine, choline chloride, vitamins (dl-alpha tocopherol acetate [source of vitamin E], vitamin B12 supplement, d-calcium pantothenate [vitamin B5], niacin supplement, riboflavin supplement [vitamin B2], vitamin A supplement, vitamin D3 supplement, biotin, thiamine mononitrate [vitamin B1], pyridoxine hydrochloride [vitamin B6], folic acid), fruit juice color, turmeric color. GREENIES™ Dental Treats are formulated to meet the nutritional levels established by the AAFCO Dog Food Nutrient Profiles for growth including growth of large size dogs (70 lbs. or more as an adult). Feed one GREENIES™ Dental Chew per day. For puppies 6+ Months. Not suitable for dogs less than 5 lbs, or dogs less than 6 months of age. Fresh drinking water should always be available.